SaaS adoption is spreading like wildfire across businesses of all sizes, and transforming the way organizations adopt software. Teams are embracing the freedom to test and adopt the tools they love quickly and easily, building customized stacks of apps for their specific needs. 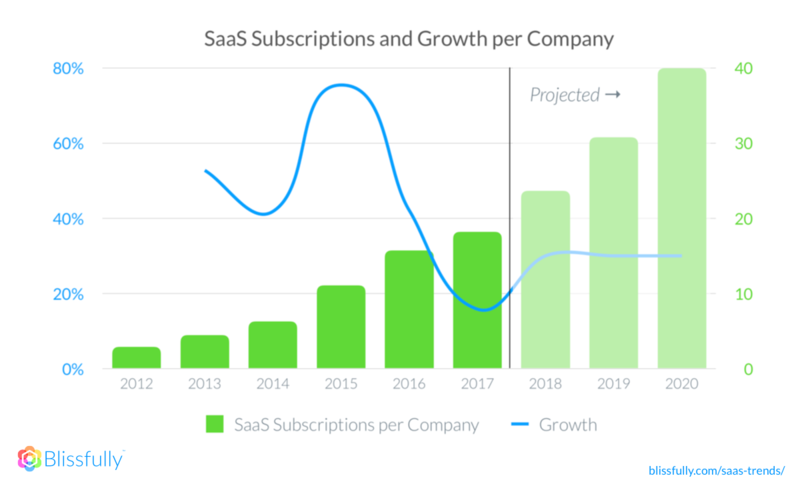 This surge in demand puts a lot of pressure on incumbent SaaS companies to compete with new entrants to offer the best possible solution, creating a sort of virtuous cycle. As a SaaS management platform, Blissfully provides real-time visibility into SaaS app usage and spend across the entire organization. On a quarterly basis, we evaluate the top trends across our platform, so you can optimize your SaaS investments. Each quarter, we analyze more than eight years of data across a sample of hundreds of companies of all sizes — from 1-1000 employees — across all business functions. There are multiple conclusions you can draw from our latest research, but here’s a hint: when it comes to SaaS, size doesn’t matter! Receive a free PDF eBook of the entire 2018 Q1 SaaS Trends Report. Why should you care about SaaS Trends? The role of IT is transforming dramatically thanks to SaaS, and has become increasingly decentralized as organizations of all sizes transition to SaaS. That means, people and teams outside IT are making their own software decisions, which is both liberating for employees and difficult to manage for companies as they grow. Whether it’s security or SaaS spending, SaaS buyer diversity has lead to an element of SaaS chaos, creating areas of growth and opportunity for companies and SaaS vendors alike. The adoption of SaaS apps is exploding across all different functions of the business. In fact, the average SMB pays for 20+ SaaS apps, and spends upwards of $20,000 a month, a monthly increase of $5,000 since our https://www.blissfully.com/blog/it-helpdesk-business-operations/Q3 2017 SaaS trends report. 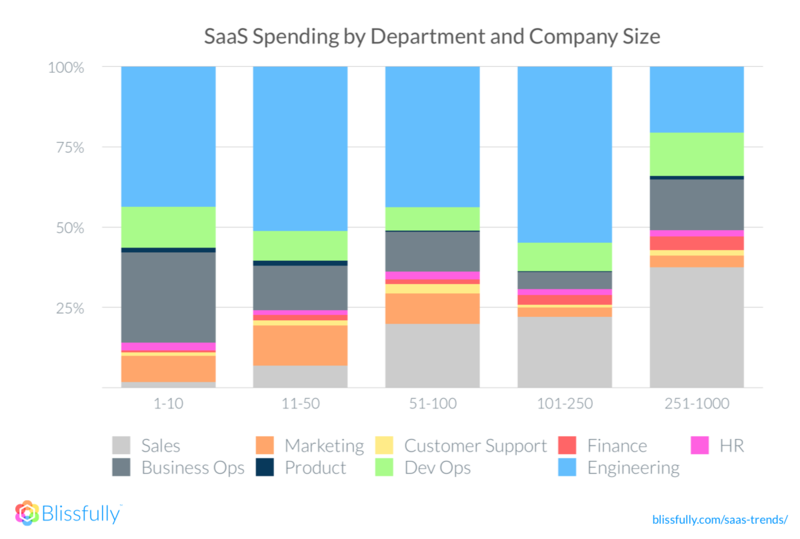 Companies big and small are getting in on the SaaS explosion, taking advantage of the ability to select the exact software they need to grow their businesses. 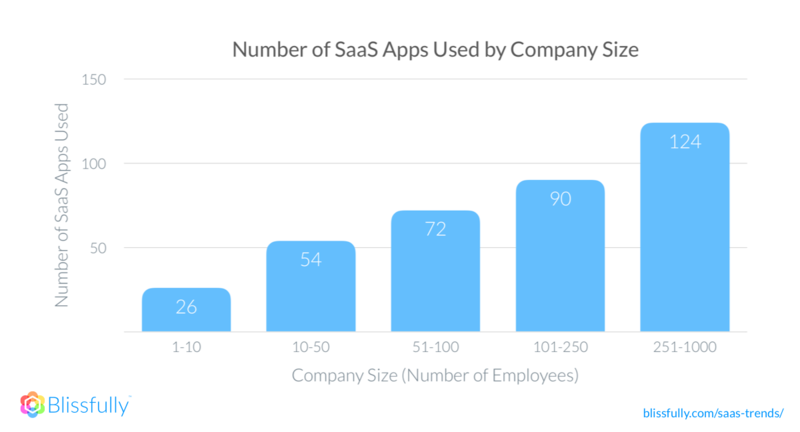 Unsurprisingly, as a company’s size increases, so do the number of SaaS apps they use. Companies with 1-10 employees use an average of 26 apps, while 251-1000 employees use an average of 124. 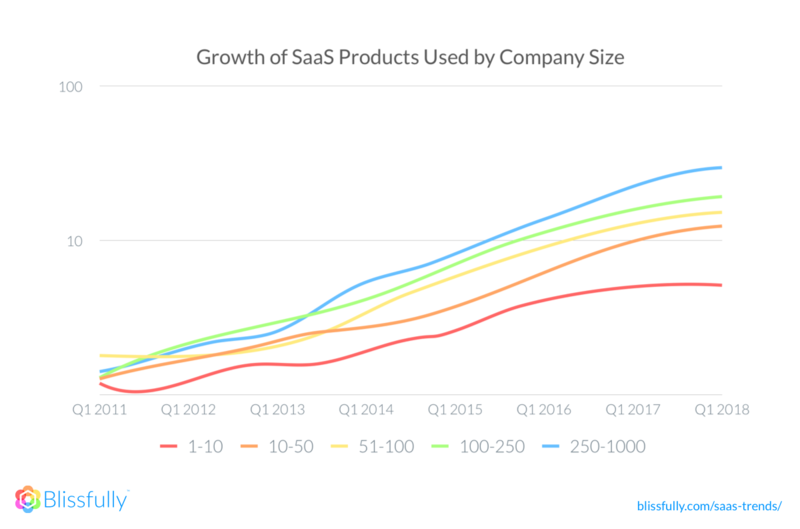 Over the last eight years, the growth of SaaS products by company size has increased proportionally. 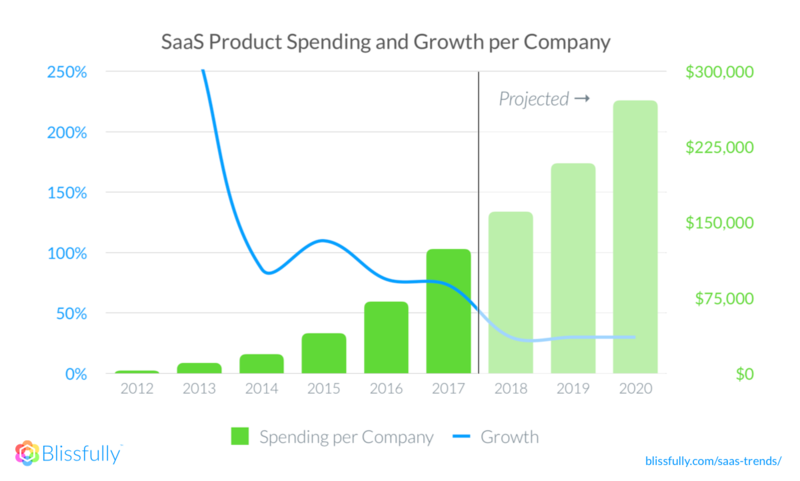 The growth rate of spending per company will continue to increase, from 2017 to 2020 the amount each company spends on SaaS will more than double, increasing by 118%. The number of subscriptions per company will also nearly double, increasing by 95%. When you look at SaaS spend across specific departments, our data shows that certain app categories grow and decline with the organization’s growth. For example, as a company’s size increases from the 1-10 range to the 251-1000 range, it spends 25x more on sales apps, and proportionally less on engineering and marketing apps (a 56% and 53% decrease, respectively). Smaller companies tend to spend more on marketing than sales, until they reach the tipping point of 51-100 employees. This is interesting news for SaaS vendors, since SMB marketing tools may take off faster than sales, and enterprise-scale engineering or marketing apps may lag behind sales apps. 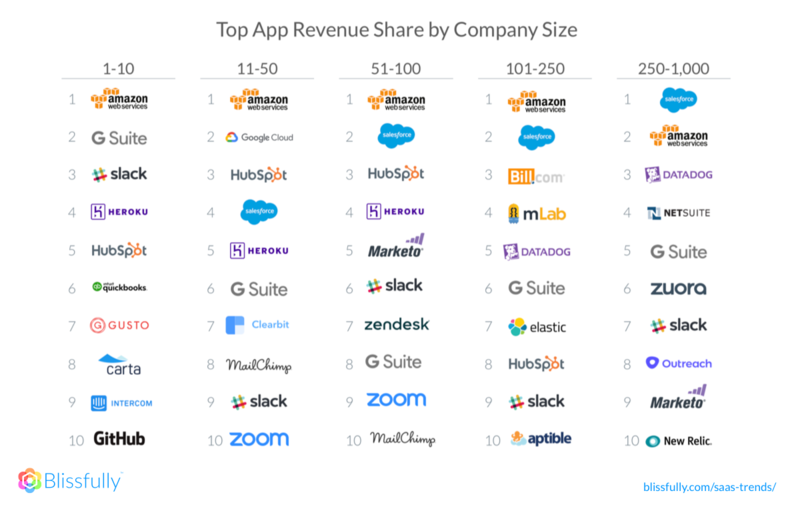 Another possibility is that additional licenses for sales applications increase with company size, as you’ll see with Salesforce’s steady rise and and leap above AWS on the chart of top 10 apps by revenue share, filtered by company size. Collaborative apps like G Suite and Slack remain popular, regardless of company size. 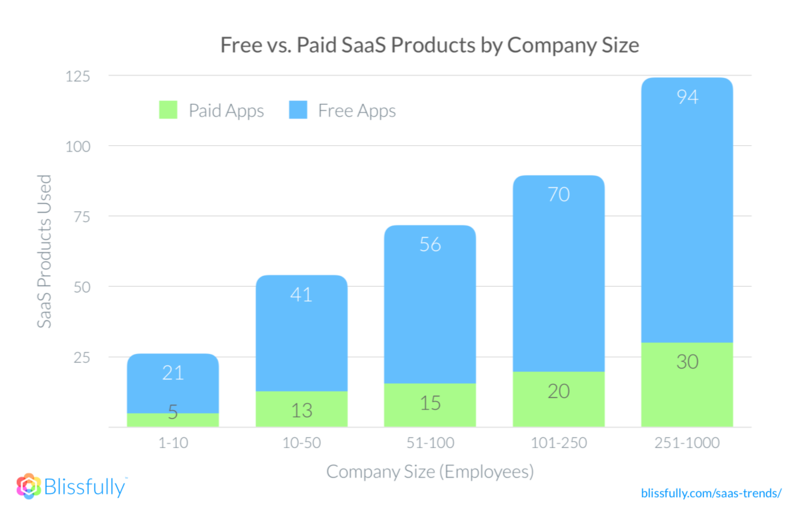 When it comes to SaaS apps, companies of all sizes use 3x more free apps than paid apps. While this trend isn’t surprising, given the number of freemium offerings out there, the breakdown holds true across company size — even though larger companies use more apps. Organizations need to be aware of this pattern, with a rise in unsanctioned tools and apps being used by employees — otherwise known as Shadow IT. Without visibility into who’s using these apps and how they’re being used, the organization potentially could face unnecessary security risks and compliance violations down the road. From the SaaS vendor point-of-view, this trend points to the fact that the use of freemium tools isn’t slowing down, and the freemium business model is still valid as a major foothold into organizations of all sizes. Competition is getting fierce in the SaaS landscape to provide the best apps for business users of all types. We’ve seen the number of SaaS apps explode in the last eight years, with an increase of 42 percent in the last year, between Q1 2017 and Q1 2018. This virtuous cycle of more SaaS apps leads to increased adoption of SaaS in companies of all sizes. 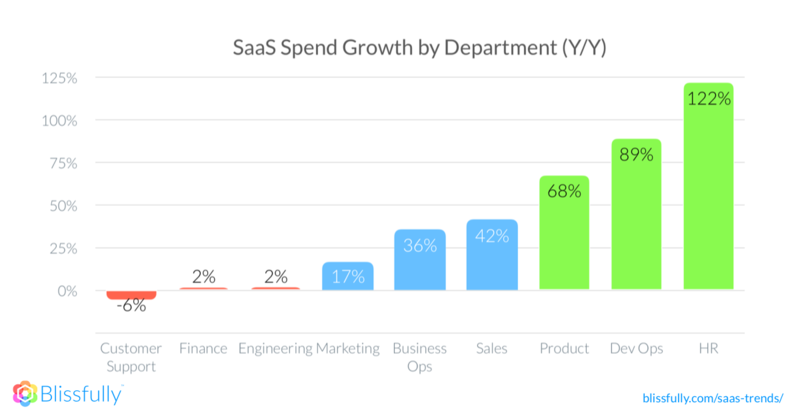 Year-over-year SaaS spend has increased across all departments, with some categories showing more maturity versus growth. Some potential reasons for this trend could be that categories such as customer support, finance, and engineering are much more mature, whereas HR apps are exploding, with more and more entrants to ease the process of automation — particularly around the category of performance reviews. 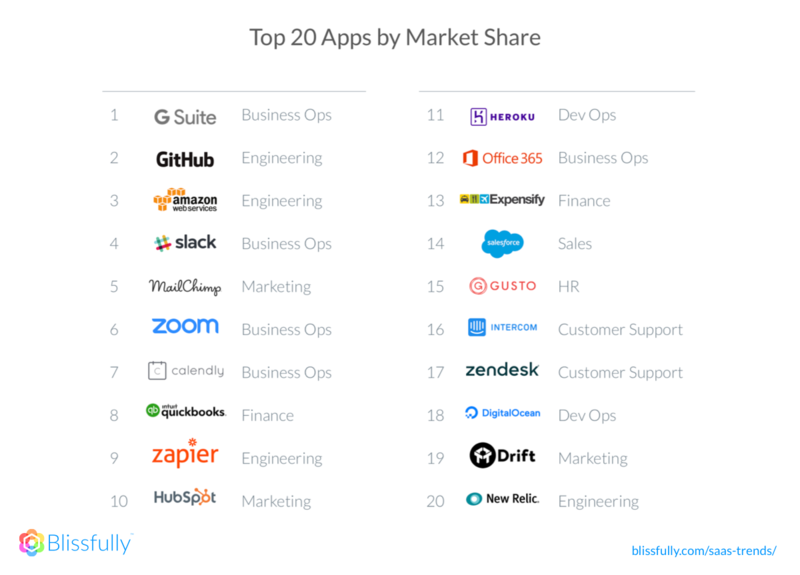 In the timeframe between now and our Q3 2017 SaaS trends report, Quickbooks and Drift made their way onto our top 20 SaaS apps by market share leaderboard for the first time. Previously absent from the Top 50 apps by market share, they’re now at #8 and #19, respectively. Other movers include Intercom, leaping from #48 to #16 and New Relic, entering the top 20 for the first time. These apps tend to skew more toward an SMB audience, and have lower average revenue per user (ARPU). 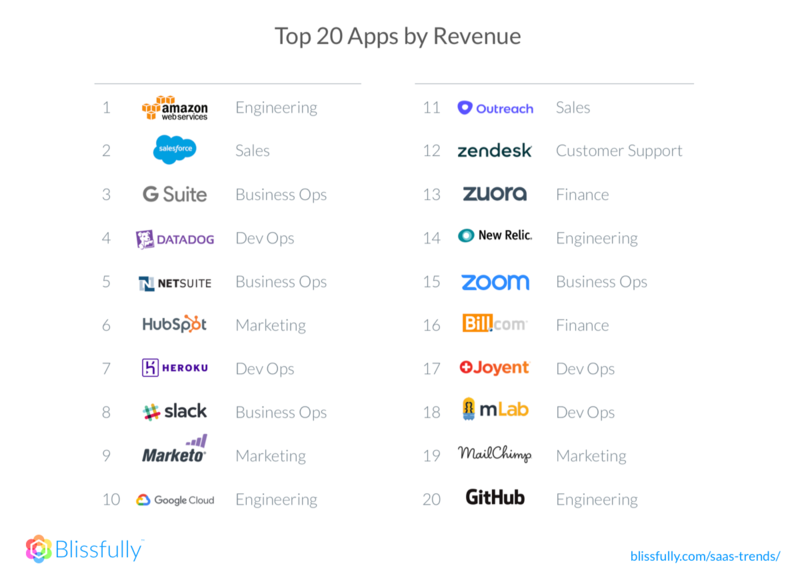 To contrast, the top 20 SaaS apps by revenue are filled with familiar faces, and tend to skew toward larger companies and have higher ARPU, with AWS at #1. 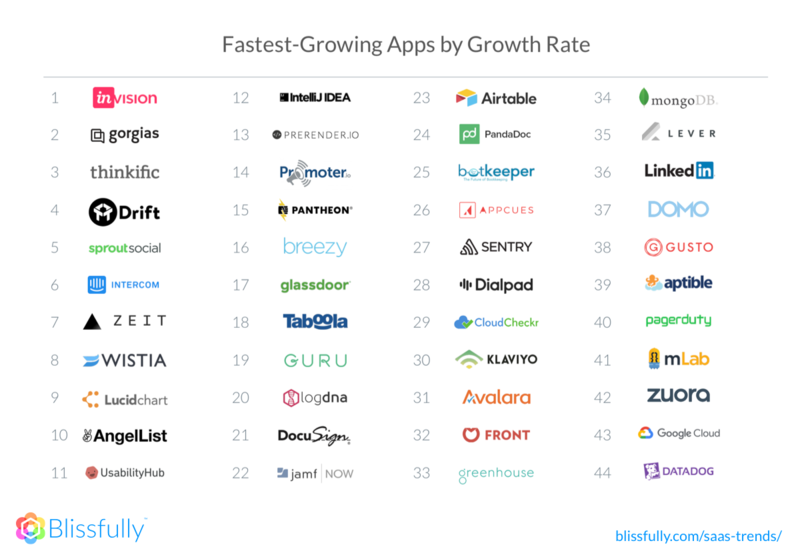 And, for the first time, we’re revealing the fastest-growing SaaS apps by growth rate, with design app InVision at #1. Blissfully helps hundreds of companies effortlessly manage SaaS sprawl, across thousands of subscriptions and millions of monthly spend. Once installed, Blissfully displays both historical and up-to-the minute accurate representations of what SaaS products an organization relies upon, sends data to, and pays for. We’re a part of an emerging trend called SaaS management, brought about by a combination of three major forces: the explosion in adoption of SaaS apps, the resulting abundance of SaaS choices for buyers, and the lack of IT oversight to manage it all. We provide organizations with the visibility, onboarding and offboarding, security, and management of SaaS spending that once was relegated to the traditional IT department. through Blissfully’s proprietary data aggregation methods. and automatic invoice and receipt aggregation.